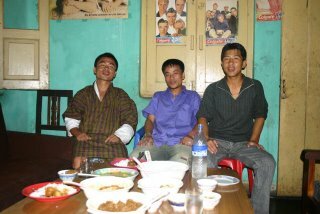 It's fascinating to observe that folks here in Bhutan are absolutely crazy about soccer. Most of the trainees here know a lot more about European soccer than I do. Some of them can even tell you the names of some Swiss players and clubs. Because of the time difference, the European games take place during the night here in Bhutan - but that's not a reason to miss a game ;-). With the soccer world cup rollin', a lot of the trainees might not get a lot of sleep. Yesterday night, I watched Germany - Costa Rica (second half) - together with I-don't-know-how-many-trainees. Was fun and I'm definitely looking forward to Tuesday. Hopp Schwiiz! It's weekend and I'm happy about that. Was a busy time and I was really tired this week. Let me just post a few pics from last week. 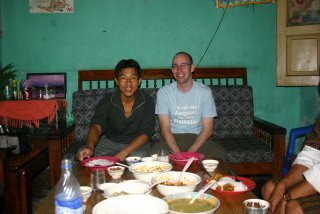 A bunch of friends together with our dinner ;-). Do you see that massive amount of rice and chili? 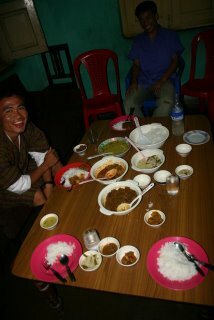 A real Bhutanese meal ;-).